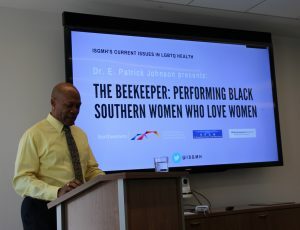 Dr. E. Patrick Johnson recently joined ISGMH to present “The Beekeeper: Performing Black Southern Women Who Love Women.” Interweaving his lecture with performances of oral histories, Dr. Johnson shared experiences of black Southern women who desire women. Dr. Johnson highlighted three overlapping themes from his work with black Southern queer women: religion, gender nonconformity, and sexual trauma. An audio recording of Dr. Johnson’s lecture/performance can be found here. Read about our upcoming Current Issues in LGBTQ Health lectures here.